If you’re a lover of clean lines, neutrals with primary colours, and accessory-free environments, then the modern design style should be right up your alley. Its essence is that it includes basic shapes, functional lines and curves, as well as materials such as metal, glass, and chrome (but sometimes a good dose of stone and brick can also be picked up). And it makes a point of focusing on spacious layouts and staying away from overly embellished pieces. So, what better way to celebrate our love for the modern style (and inspiring you to give this style a try) than by looking at a suburban home that is very much the epitome of modern design? Oh, and did we mention that it’s also super elegant? Viewing the house from the street’s side, we can already see a decadent amount of modern features displayed: the neutral/natural tones, no excessive decorations or embellishments, clean-cut lines, an asymmetrical balance in the volumes, etc. 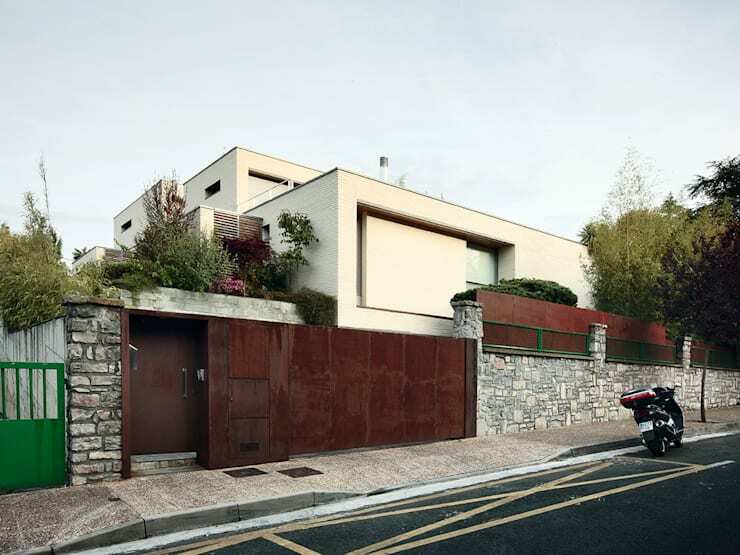 A flat roof is also a very characteristic feature of the modern design, and features proudly here too, making those rectangular volumes even more prominent. Our favourite piece here? It has to be that raw stone wall that offers a stylish and charming touch of rustic flavour to this modern scene. The tables are turned at the back side, because here we get a much more open and inviting view of the house than at the front side. 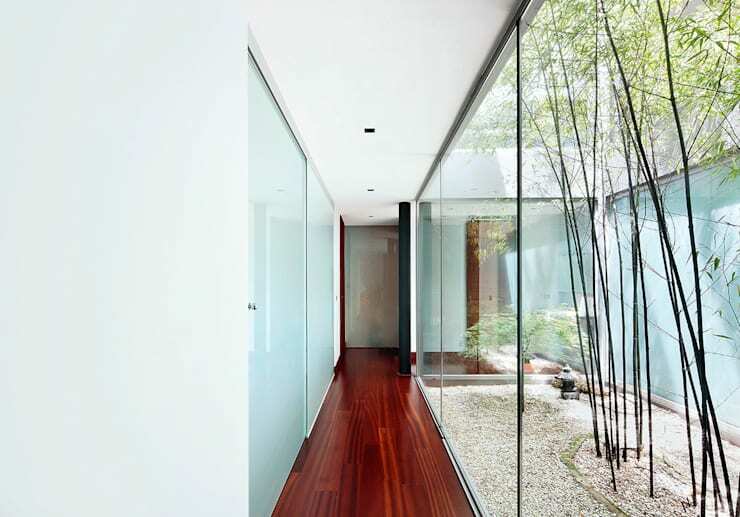 Generous amounts of glass panes ensure stunning views of the interior spaces. The cubic shapes continue here, albeit in a less stacked way than they appeared at the front. And how stunning is that pristinely maintained garden, complete with swimming pool? In addition to splendid scenery, what else is compulsory for some outdoor relaxation? If you were thinking comfortable (and stylish) furniture, you’d be correct. The pieces here exude not only a modern style, but a truly royal one: a hammock; a stunning skylight; wooden panelled decking; a dining set that exceptionally combines glass and rattan… the elegance never seems to end here. Architects, designers, floorers, lighting experts… we have them all, and more, right here on homify. Check out our: professionals page! We finally treat ourselves to an interior view – and yes, it is everything we wanted it to be. 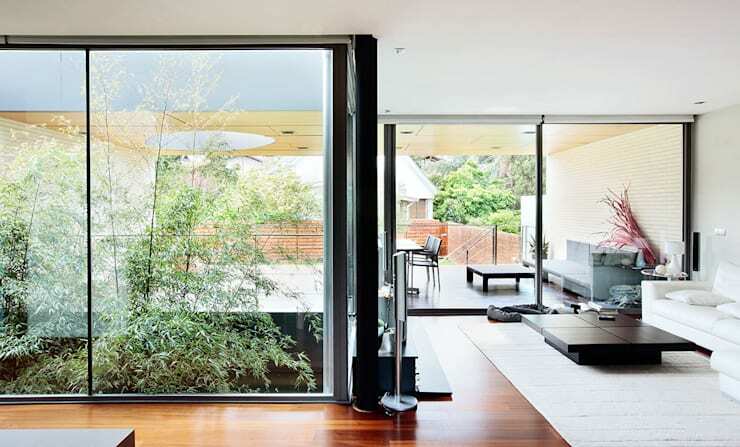 Those generous windows and glass doors ensure that the lush garden settings gently seep indoors, as well as a stunning dose of natural light to make the interior neutrals glow. A clean lined design makes for a visually spacious layout, which can also be contributed to the minimal use of textures. Clean, straightforward, and unapologetic about its stylish appearance – yep, most definitely the modern style! Sunshine seems to be one of the prime décor pieces, as it follows us everywhere – even down the corridor that leads to the bedrooms. Notice the perfect colour balance: warm cherry-wood flooring contrasting with the crisp-white walls and ceiling. This neutral colour canvas means that any additional furniture- or décor pieces will look most fitting and striking, regardless of their colours; yet we think this space looks perfect as is. 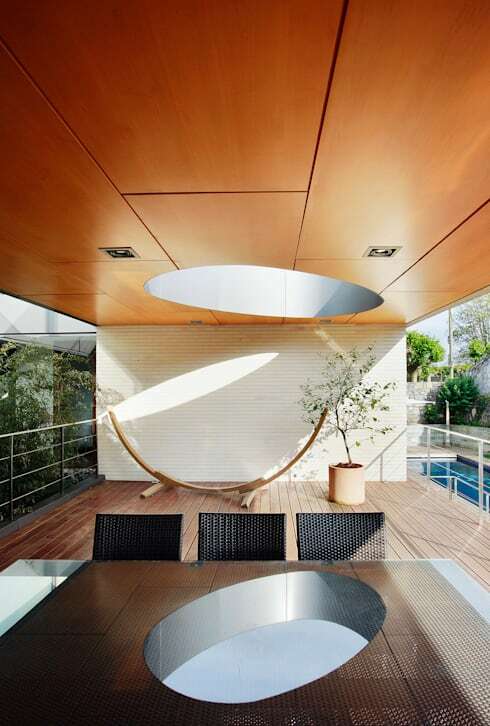 Before we bid farewell to this modern beauty, we have to take another look at that exquisite back yard. Isn’t it just perfect how the man-made structures (wooden decking, concrete walls, swimming pool) combine with nature’s handiwork (fresh grass, tall trees, and clear-blue sky)? In the mood for more modern magic? Then feast your eyes on: The House of Modern Magnitude.